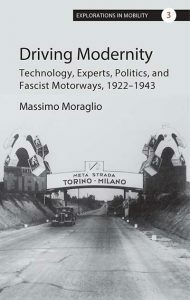 Massimo Moraglio’s new book, Driving Modernity: Technology, Experts, Politics, and Fascist Motorways, 1922–1943, will be published by Berghahn in February 2017. Summary: On March 26th, 1923, in a formal ceremony, construction of the Milan–Alpine Lakes autostrada officially began, the preliminary step toward what would become the first European motorway. That Benito Mussolini himself participated in the festivities indicates just how important the project was to Italian Fascism. Driving Modernity recounts the twisting fortunes of the autostrada, which—alongside railways, aviation, and other forms of mobility—Italian authorities hoped would spread an ideology of technological nationalism. It explains how Italy ultimately failed to realize its mammoth infrastructural vision, addressing the political and social conditions that made a coherent plan of development impossible. To see book flyer, click here.